In many cases... If there are several spaces, you can merely use a dummy frame for each space needed. Where more than one dummy goes into a box, I usually arrange the dummies in equal numbers either side of the occupied frames. 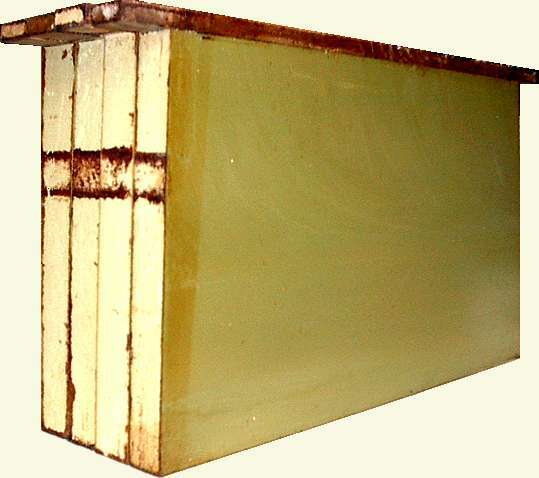 I have also filled large spaces within hives using division boards made from skinned polyurethane foam, these have been placed in groups of three or four stacked flat together so that there are no gaps between them. You will notice some propolis staining on the ends of the division boards in the photograph... Normally, as these devices are almost exactly the same size as the inside dimensions of a hive, the bees do not have access to the ends, but I used to have large quantities of National ekes that could be used in conjunction with an empty National super to form a box that would accept BS deep frames. Such an arrangement was often used by me to form nucs over the top of a queenright colony in much the same way as Ben uses for queen rearing. As the super has it's own lug space the arrangement leads to the existence of a gallery at each side of the box that the bees have access to, hence the propolis staining seen in the photograph. the nucs that were formed by this method were usually three, four or five frames and so there were big spaces to fill up. had I not had these skinned polyurethane foam division boards available, I would probably have made block fillers rather like those that Ben uses. I have made and used frame feeders that occupy the space of two frames, which gives considerably more than double the feed capacity, however I have never seen the need to make dummies of this two frame width or any other multiple of frame widths. There is a case for using some special multi frame dummies in the method of queen right queen rearing that is practised by Ben Harden in Ireland. Ben himself describes these as items that can be simply made and that the dimensions are not particularly critical as they are only in use within the hive for ten or eleven days at a stretch. My attitude is that if a piece of kit needs to be made at all it might as well be made to the best possible standards. However with Ben's method there is the possibility that provision of more liquid feed, directly alongside the frames used for the rearing process, may give better results. So I offer here a couple of designs of dummy frames that can be used to occupy unused space within a bee hive, to avoid the bees building wild comb. These have a secondary effect of concentrating the attention of the bees on to a small number of frames. The items shown will suit B.S. National bee hives (Ben himself uses Langstroth). Two versions are given here, the first being totally dumb and designed to fill the space of three and a half BS frames, the second is of similar 3 1/2 frame size, but incorporates a very narrow feeding space on one face. When raising queens I have a personal like of feeding honey at a dilution of 50%, and by limiting the amount of feed that can be held, this reduces the risk of fermentation. The small surface area, when compared with the depth, reduces the evaporation of the water content and thus helps to avoid concentration of the feed and consequent crystallisation of sugars. Ben suggests twenty grafted larvae can be raised by the bees, I am not going to differ, but as a 'belt and braces' man I want to have adequate feed available. Certainly in the area where I live the supply of nectar can shut down at the 'drop of a hat' and a bit extra is unlikely to go to waste. Once such a narrow feeder has been emptied, there is no inclination for the bees to build wild comb in it. If the occasion does not warrant feeding, the dummies can be placed with the empty feeder sections towards the outside of the hive, in which position they will be ignored and even if not ignored there is still no inclination for the bees to build wild comb in the narrow space. A very narrow feeder like this does not require a float, as the bees can reach one vertical face or the other very easily. Construction details are left to the individual, as much will depend on materials already to hand. If I were making some I would use 432 mm long strips of hardwood 22 mm wide and 9 mm thick to make the hangers. The box would be formed using softwood strips 18 mm square, then paneled in plywood. The body of the box would have external dimensions 356 mm long x 133 mm wide x 215 mm deep, which would make it suitable for use in a National hive and it would take up the space normally occupied by three and a half frames. There would be a bee space all around, which would keep propolis and burr comb to a minimum, but as they would not be used for very long, any deposits would be small even if the dimensions were not exact. A portion of the outer skin of the feeder is shown removed, in order that the interlock of the spacing ribs can be shown, such a technique helps to ensure that the feeders do not leak. The strips used would be 22 mm x 9 mm softwood as that material is always available in my workshop. Construction should be similar to the simple version above, with the same external dimensions (including the feeder), but make the feeder first... Then add softwood strips to the rear face of the feeder to form the starting point for fabricating the box itself.